I present to you Little Miss Bronte and Little Master Carroll- available March 1st. I can hardly wait! Don't you wonder what other classics are going to get the BabyLit treatment? As it happens, I just finished reading the Jane Eyre inspired tribute book (like a tribute band) The Flight of Gemma Hardy by Margot Livesay and started Alice, I Have Been by Melanie Benjamin about the real life Alice who inspired the story. Cover Me is an irregular soon to be regular series highlighting the wonderful world of cover art. I am determined this year to wrap our Christmas books and read one a night to the kids. Although some version of this has been done in our home, the books have not been wrapped, and as usual I have lacked consistency - could I blame that on all those birthdays? Typically I like to add one new book to the mix (and then stock up on the 1/2 price sale after Christmas). The Carpenter's Gift: A Christmas Tale about the Rockefeller Center Christmas Tree by David Rubel illus by Jim LaMarche. This was recommended by my school librarian who I believe saw it on 7 Impossible Things. I also nerded it up by ordering the Rockefeller Center Tree puzzle (only $5 at B&N). Also, I meant to blog about this BEFORE Thanksgiving, but we were plagued with a nasty stomach bug. Ew. Fans of author & illustrator Melissa Sweet - ahem, Elizabeth - have you seen this? Add that to your list too! Do you have any Christmas reading traditions? Any holiday books catching your eye? Do tell. I'll be back (I think) later this week - there is much brewing, including my Chronicle Books Happy Haulidays wishlist! Have you seen this? ACK! Little Miss Austen: Pride & Prejudice - a Baby Litboard book is a new counting primer by Gibbs Smith Publishers. Written by Jennifer Adams with art by Alison Oliver, there is also a Romeo & Juliet version, and I believe a plan for more. And it is too stinkin' cute for words. I read a few comments by some outraged purists who find it offensive to dumb down the classics for toddlers. And while I completely understand that much of the appeal is geared toward women like me who love the cleverness and cute illustrations, I don't care! File this under: I wish I'd thought of it! What do you think? All I know is Evie read it with me, then quickly squirreled it away in her bedroom instead of putting it in our "common" book pile in the family room. Hrumph. Oh, and congrats Jude! You've won a copy of Rules of Civility by Amor Towles. Stay tuned tomorrow for another giveaway when I review the book Girls Like Us by Rachel Lloyd. Snowflake Bentley is one of our favorites and I think it's time we finally saw his photographs. What were your family's favorite reads this year? Diamond & Sky by Marilyn Hoobler, 44 pages. As a horse crazy young girl, this would have been on my shelf right next to Misty of Chincoteague. It is a wonderful pre-chapter book about a mom teaching her young sons about horses and riding. The family has two ponies, Diamond & Sky, and the mama gently instructs the youngest boy Judah while his brothers are out playing football. When Diamond becomes ill, they work together to nurse him back to health. Besides being an enjoyable story, it is also a great lesson in the work that goes into caring for a horse. This book succeeds because it shows the realities of owning and tending to an animal as well as a showing a family working together. The only other book I can think of of comparing it to is one of our family favorites, Billy & Blaze: A Boy and His Horse by CW Anderson. It has the same classic and timeless feeling - due in part to the simple and lovely pencil illustrations. A former science teacher, Marilyn Hoobler lives in Maryland with her husband and six children, keeps horses (and a variety of other animals) and is currently working on another book. Her first book, Sam the Tail Up Dog is also available through Amazon. Thank you to Marilyn for providing a review copy. Do you have a favorite animal storybook? Do tell. There are only 11 costume prepping days until Halloween but you aren't too late to catch this one. The 13 Days of Halloween can be read or, as we prefer, sung to the tune of The 12 days of Christmas. A spooky serenade unfolds as the "green man" (our name) tries to woo his lady friend with an odd assortment of gifts. And the boys think each gift is funnier than the last - thanks in part to the wonderful illustrations. We all have our favorites - mine are the three fat toads with baby bonnets. The illustrations are lively - each one a fitting and fun accompaniment to the verse. With so much to see on each page, we find a new creature every time. And the pictures are not too creepy. I don't like creepy. I'm giving my gently used copy away and in order to get it mailed before Halloween it's only going to stay open a short time. Leave a comment and tell me about a most memorable costume - it can be one from your past or something your children wore. Giveaway ends Wednesday (that's tomorrow) @ midnight EST. I don't know about you, but one of the first things I notice when I visit someone's home is if they have books. I think a home is incomplete without a bookshelf or six and if you were to come to our casa, you will probably trip over a book on your way to the shelves. So I'm always noticing book decor and tips for organizing etc. Here are some I've come upon in the last week. Nesting Place - in the midst of an EXTREMELY insightful series "31 days to a better dressed nest" is a post about bookshelves. On a tangent, this is the site where I found my basement paint color Tobacco Road...having never actually seen it in person before it went up on the wall. And she is right, it's fabulous - and now I do whatever she says. Feel free to link to your favorite bookish pics or products in the comments. I'd love to see more! 2. Evie is almost 4 months old. How can that be? She's working on rolling over and losing hair, progressing in both areas. Happy as ever. Owen: (bends over) like this? I spent 3 days finding my first piece. Right. 4. I'm excited that my favorite children's book "trilogy" is now a board book set. This is my new go-to baby gift. 5. This year we did not have our traditional bag o' books. The Kindle at work. We did have the technology tote...a sign of the times I suppose. Yeesh. 6. Speaking of Kindle...they are down to $259. 7. Ready for October and all that it brings - even the sweater weather. I must admit I didn't expect it immediately, but cold mornings are jolting us back to reality. And I'm back to hot coffee and lots of it. 7. While away we discovered there is a name for when you learn something and then it seems like its everywhere - Baader Meinhof Phenomenon. And now you'll hear Baader Meinhof Phenomenon at every turn....tee hee. 8. How about another Evie? just because. 9. Can someone explain Tumblr to me? I'm seeing it, and it looks cool. Is it like an online bulletin board? 10. Looking forward to returning to a more regular blog schedule. I've missed you, my peeps. *I realize this is posting on Wednesday, but my loophole is that 8 of the 10 items were written on Tuesday - I blame my browser for locking me out repeatedly from 10pm on. 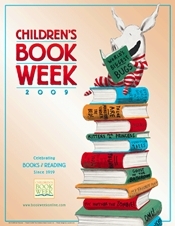 Is National Children's Book Week. Not that we need an excuse to celebrate children's books but we'll take it. For more info go here. The poster is adorable and you can send away (cheaply) for a poster & activity book. Plus there's a downloadable bookmark by Dan Yaccarino. And check out what's going on in your local libraries and indie stores.